It is the story of the day. Scan the headlines and everywhere that touches technology has a tidbit on the subject. The mysterious G-phone, a myth as exotic as an udumbara flower and as circulated as a chain email has finally been revealed. The urban myth quashed. Today, Google revealed as widely expected there will not be (at least for now or the near future) a Google branded cell phone; no gPhone to challenge the iPhone. Instead, Google has been applying its considerable software development skills to the development of a next generation open-source mobile operating system platform. Engineers with analog and cellular design experience were there for optimization, for marrying software to hardware, not to reinvent the phone itself. Andy Rubin, head of Google’s mobile platforms said unequivocally, "we’re not building a GPhone; we are enabling 1,000 people to build [it]." The platform, named Android after Rubin’s prior company (which Google acquired in 2005), is aimed at matching and exceeding today’s smart phone software on features and especially, Internet accessibility and optimization. It will be licensed under a general open source license and a software development kit (SDK) will be made available to empower 3rd party application development. Details offer no confirmation but it’s also possible that features from Grand Central, a VoIP company Google acquired this year could be incorporated too. The Android SDK will be available within the next few weeks. The OS won’t be released until commercially ready. It’s expected to be on phones released in the market by late 2008. Major phone manufacturers including Motorola, Nokia, as well as operators like T-Mobile, and international mobile companies like NTT DoComo are expected to particpate or support the platform in some way; as is the rest of the 34 member Open Handset Alliance. Google states of Open Social "The ultimate goal is for any social website to be able to implement the APIs and host 3rd party social applications." 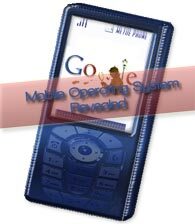 Android as an open Operating System has similar elements. It’s a shrewd strategy on Google’s part. In one move their "open" approach creates a bridge that allows Google to cross into a host of private properties which otherwise might have been off limits. Now, instead of needing singular partnerships with websites, or mobile phone companies, and instead of having to optimize their services (Google software and advertising) for a multitude of different environments, they optimize for just one. Between coding and licensing, Google Maps and AdSense ads on a cell phone might have been complicated, if not impossible, to launch on different proprietary phone operating systems. But all the same OS? – One that Google built (with the goal of including its applications from the start)? That’s a different story. By building the platform, Google’s advantageously positioned themselves to insure all of their services – from YouTube to ad streaming, to maps – will function at the time of roll out. Characterize the strategy as both defensive and offensive. Defensively, OpenSocial and Android empower competition and portability. Doing so prevents sites like Facebook (or phone manufacturers) from making themselves an island (which would be to gain the kind of power Apple developed around iTunes and the iPod.). Offensively, getting a head start is a good way to win any race; and even better if you designed the course. The brilliance is revealed partly in turning the lens on incentives offered to participants. By giving value without asking for direct payment Google provides incentive for other companies to use their services. By increasing feature sets and availability, they’re stoking consumer demand. By making their platform open to other developers, Google harnesses the power of the crowd; they rely on others to build and create incentive for viral growth. And for Google, the more people that embrace the platform, the better Google’s position for capturing advertising revenue. The one glaring trouble with Google’s plan lies not for the consumer, nor Google, but for companies who may be tempted to take the sweet bait Google is offering them. For these phone makers, the ubiquity of an open system stands to marginalize the unique value that might have otherwise been found in product differentiation. This marginalization is best illustrated by the iPhone. Apple’s built a brilliant, and market changing operating system and user-interface. Its unique features are drawing customers and raves. But what if every phone maker had access to the same interface? What if every iPhone and wanna-be iPhone clone become interchangeable? (Even if he phones differ by design, or hardware features (a more powerful chipset, more memory), in how they operate, they become increasingly alike. ) In that scenario, Apple’s iPhone advantage diminishes dramatically. Android, if adopted, poses that risk for the phone industry. Some may say that is irrelevant, that phones are already commodities and that’s already the state of the industry. They may be right, but it’s debatable. Regardless, Android stands, just as the iPhone did, to shake up the industry and spark change. Whether widely accepted or not, the features Google develops will be a catalyst for mobile advances. Google say their goal is open access, but realistically, that’s a half truth. Open access is so they can get in the door first. It’s open access so they will have a head start on grabbing advertising dominance. Few companies have the depth of resources and cash to take on a big loss leader (which is exactly what OpenSocial and Android are). Google can afford to take on those costs. TV, Gaming, Internet, and Now Mobile: Google’s looking to control advertising on all fronts…There can be no mistake, Google’s gone far past firing a shot over Madison Avenue’s bow. They’ve launched a full on assault.